One of our best-selling heart-shaped wedding favors! Your guests will love to receive these unique wedding coaster favors, and they will be reminded of your love each time they use the coasters in their home. Each set of 2 heart-shaped coasters is made of durable tempered glass with a number of love-related words and phrases frosted on the glass. 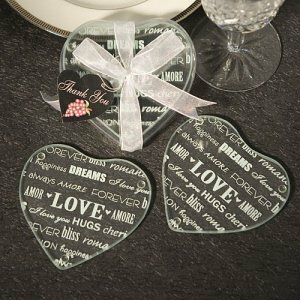 The coasters measure 3 3/4" by 4 1/4" and are packaged in a clear gift box tied with a white organza bow and heart-shaped, vineyard collection thank you tag. I was hoping to personalize this gift with my daughter's wedding colors. Would it be possible to either change the color of the organza, or to not include the tag and bow and discount the product so that I could purchase the colors I need on my own? We unfortunately can't alter this item as it's prepackaged in the production stage and we do not have the option to change anything on it.